One Sunday morning a few weekends ago, I opened up my computer to play some video games. I had a mess of games to review, but I ended up in The Witcher 3. There was this tree I wanted to find. I had finished the story of The Witcher 3 a week or so before. I'd started the game back in 2017. Finishing was a long road, full of a lot of foot-dragging and sidequesting and generally putting off the inevitable consequence of finishing, which would mean not having any more Witcher to play. Since then, in a desperate effort to still have some Witcher in my life, I've been reading the books and watching a lot of YouTube videos about the game. One of those videos, a Witcher 3 documentary from Danny O'Dwyer's Noclip, was full of neat stories, including one about a bug I'd never heard of: during development, removing an item in the game by pressing control-Z would teleport it to a specific place. The team eventually figured out that all these objects — tankards, houses, weapons, trees — were at the dead center of each region. They nicknamed it the "zero-zero bug," after the coordinates where they found their missing objects. In Skellige, this area is under the water off Ard Skellig, but in Velen, it's near the Baron's home of Crow's Perch. 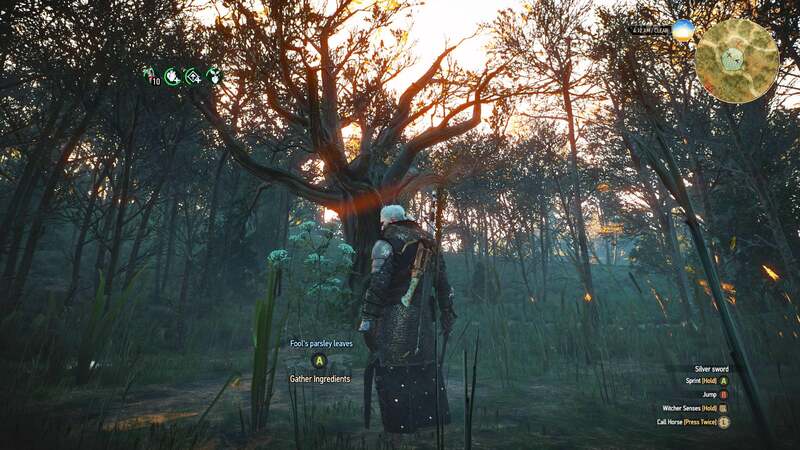 The developers commemorated the bug in-game by placing a "special tree" in Velen. The documentary shows an image of the tree, along with the details that it's in "a forest, with a little creek" and that it sits in the middle of the map, at 0,0. I had to find the tree. 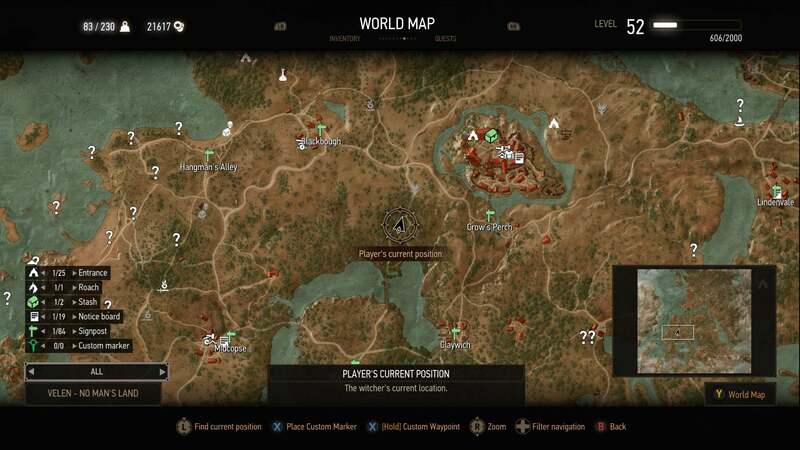 Mods and cheats will give you Witcher map coordinates pretty easily, but I wanted to take the journey a quest of this nature warranted. A bit of searching online led me to a list of notable map coordinates for the game, which included the tidbit that the stairs of the Baron's castle are at 170,170. From there, I figured, it would be pretty easy to find my way. I'd left Geralt in his house in Toussaint, so I fast-travelled to Crow's Perch in Velen. From there I made a rough guess where the tree might be using the coordinates of the Baron's steps and eyeballing what seemed like the middle of the map. I then wandered through the woods for a while, looking at the trees. I hadn't been to Velen in a while, and I got off course pretty quickly mopping up some markers and slaughtering nekkers. It was a nice reminder of how low-level I'd been when I was first in this area, how confused and turned off by The Witcher 3 I'd been. The game had won me over since then. It had taken some time and effort to get into a game I thought I was supposed to like, but it had paid off. Sometimes, I like to think about the first time I heard a favourite musician or read a favourite book and trace back how I found them. It always surprises me how easy it would have been to miss things I can't imagine living without - if I hadn't heard a new friend play Billy Bragg on her guitar one night at a Boston house party, if I hadn't grabbed Robert McLiam Wilson's Eureka Street from the very back of the bookstore's fiction section when I was 18 because my mum was hurrying me to pick something and I was (and still am) chronically indecisive. The Witcher 3 feels like that now: a game I can't imagine never having played that I wouldn't have given the time if my Kotaku colleagues hadn't praised it so often. I wonder what other books or games or art are out there, waiting for me to find them and make them my favourites. It wasn't too long before I found the tree. It was pretty distinctly placed on the map, and the image from the documentary helped. A couple nekkers disturbed my reverie, and I quickly dispatched them. I walked around the tree, studying it from every angle. It didn't look too different from other trees in the game, really, but I'd never thought about The Witcher's trees that much. Despite riding through the woods pretty regularly, I'd only stopped to admire the vistas, never the everyday scenery. I listened to the tree groan as the wind moved through its gnarled branches. I thought about all the work that must have gone into making it, about the story behind it, and about about all the other secrets the game still has to reveal. Here's where the tree is, if you want to find it for yourself. Finding the tree was reminded me that though the game's story might be done, there's still a ton of The Witcher 3's world I haven't seen. A few of my friends have recently picked up the game for the first time, and I'm already telling them which bits they shouldn't miss, just like everyone did for me. Thanks!! Inspired once more!! My new 4k TV arriving soon and I will revisit on my Scorpio and do it all over again, but will be even more stunning than before! Hmm, reminds me I still haven't finished either of the DLC. Going to look good in 4k on my Xbox One X! Seriously, do yourself favor and get stuck into the DLC. It’s epic. I agree with one particular comment in there: The Witcher 3's clunkiness and initial inaccessibility are its own worst enemies - I know many people who never bothered with the game thanks to the poor early impression it makes. That's a great pity because the rest of the game world is immensely artistically and technically accomplished. I had this same problem with The Witcher 2, I never made it past the first hour. It also felt very linear. Now having played and loved The Witcher 3, is it worth my time to go back and try The Witcher 2? Yeah, that initial period didn't do a great job of selling whats such an incredible game. It took me a couple of tries to get into the game, but once I did I spent weeks just running about grabbing markers, or doing side quests. The sheer quality of the game snuck up on me, and suddenly I'd spent 100+ hours and realised that nothing had really changed from that initial experience apart from me. I put it down to Velen being easily the most generic part of the game. Its look has been seen a thousand times, as have its monsters, and with your character barely developed, you're only using a couple of skills so not seeing where the game takes you later. Many of the quests are just "collect 10 rat tails" or "go kill Mob X" type quests as well. Not exciting, and not indicative of the main story in any way. By the time you move on to Novigrad, you've moved past that though, and the gameplay more than makes up for it. Then the rest of the games beauty starts to shine.